Oh my poor neglected blog. I made these cupcakes back in March during sugaring season in Vermont because I was missing Vermont. Missing the smells of a sugar house and all things mapley. So I decided to make my own maple goodness. As soon as you add the maple syrup the batter goes from meh to OMG IT SMELLS SO GOOD. The recipe calls for walnuts so I used walnuts. But I think pecans would be equally good, if not better. I’m not a huge fan of nuts so if I make these again I’d leave them out altogether. If you’ve never been inside a sugar house when sap is boiling you really don’t know what you’re missing. It smells so good. 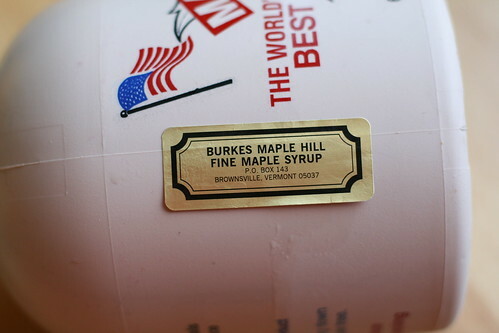 The air is moist and heavy and the sugary sweet smell of maple syrup is overwhelming. In a good way. The smell of these cupcakes was super delicious too, but nothing compares to being inside a sugar house. The frosting recipe called for brown sugar. I was a little wary of that but did it anyway. I will say right now that while the taste was good (although I used more than double the maple syrup it called for) it had a crunch to it. It wasn’t totally unpleasant but not totally pleasant either. Next time I would not use the brown sugar. 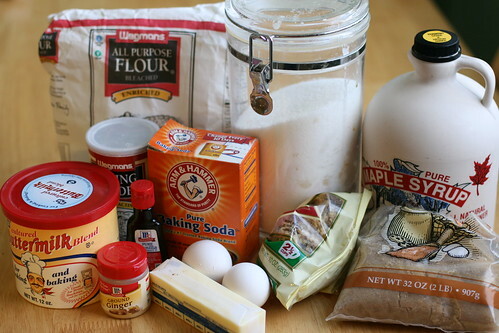 Sift the flour, baking powder, baking soda, salt, and ginger together. Set aside. 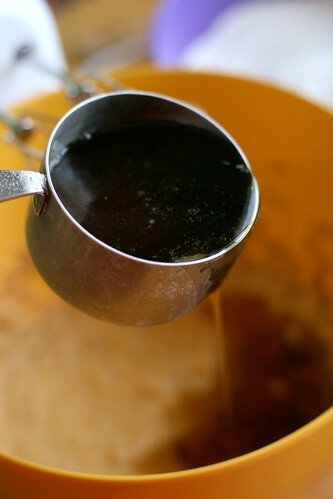 Add in eggs, syrup and vanilla. Mix until blended. 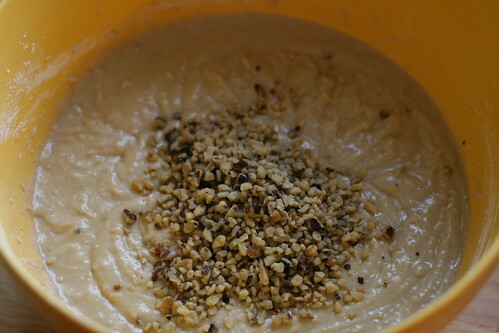 Then mix in the flour mixture alternating with the buttermilk. Do about one-third of the flour and then one-third of the buttermilk, and so on. Add in, by hand, the nuts. 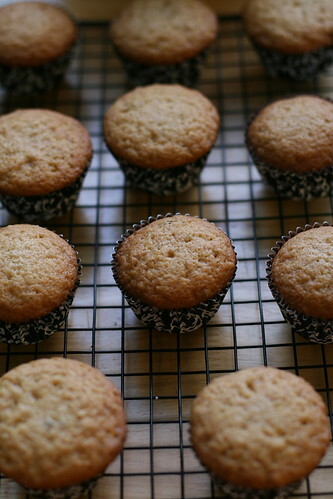 Fill muffin or cupcake tins, either lined or buttered, according to your preference. Beat the softened butter, cream cheese, brown sugar and salt in a medium-sized bowl until fluffy. Once again, it is critical that your ingredients be softened. 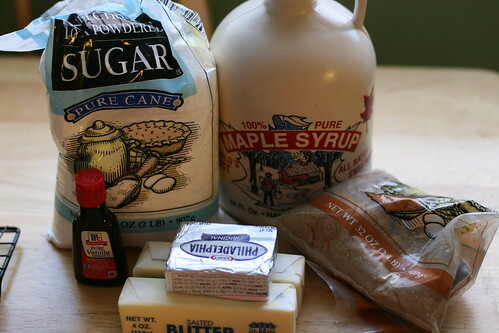 While you keep beating, add both the maple syrup and the vanilla. Slowly add the confectioners’ sugar and gradually increase the speed to high. Continue beating until the icing is fluffy. 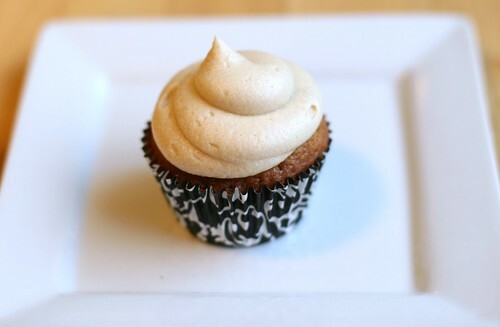 Chill the maple-butter frosting for one hour before using.